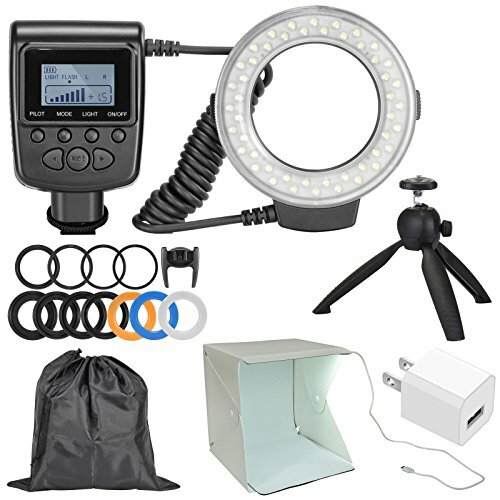 The Precision Design 130 Universal Macro LED Ring Light & Flash is compact, lightweight and ideal for close up photography. It features a 48 LED continuous light source with adjustable brightness. This flash will work with most camera lenses, with eight included adapters from 49mm to 77mm. The power control unit can be attached to your camera's hot shoe, or it can be mounted separately. A 2-inch LCD screen displays battery power, light output power and flash mode. Requires 4x AA batteries (not included). The Precision Design PD-PLB1 LED Portable Light Box Studio is designed for use with all types of cameras, smartphones and tablets. The PD-PLB1 is a 8.5 x 9 x 9" white plastic box structure that folds flat for portability. Ideal for macro photography and shooting small items for e-commerce, the PD-PLB1 illuminates subjects with 20 daylight-balanced LEDs. Includes black and white backgrounds, plus USB power cable. This USB AC Wall Charger Plug plugs directly in to a standard wall outlet and charges your iPhone, Samsung Galaxy, other smartphone, GoPro, tablet, digital camera or other digital device. Cable not included. The Sunpak FlexPod Tabletop Tripod with Ball Head is easy to carry and ready at a moment's notice. It weighs only 4.5 ounces (128g) yet it will support a camera up to 2.2 pounds (900g). Measures just 6.9 inches (17.5 cm) when folded, so you can take it anywhere. The Precision Design Drawstring Storage Pouch is a multi-purpose pouch ideal for travel and stoarge. Made from durable nylon fabric, this pouch measures 11 x 11 inches (28 x 28cm). If you have any questions about this product by Precision Design, contact us by completing and submitting the form below. If you are looking for a specif part number, please include it with your message.